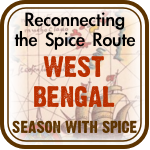 Goan cuisine has very strong Portuguese & Iberian connections. 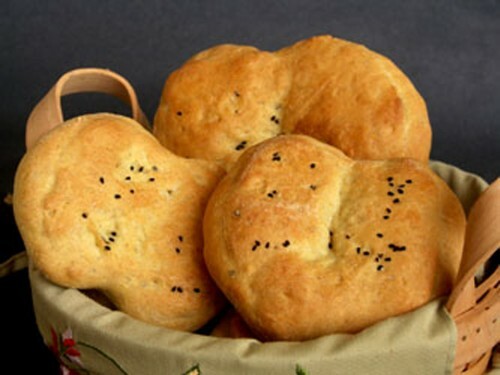 The art of baking bread was brought to Goa by the European Missionaries. The bread came to be such an essential part of a Goan breakfast that there came a time, “towards the end of the Portuguese rule, when every village had its own local bakery.” Goan bakers adapted the European influence and added local ingredients to their bread giving it a very distinct Goan flavour. They used to use toddy instead of yeast for leavening. 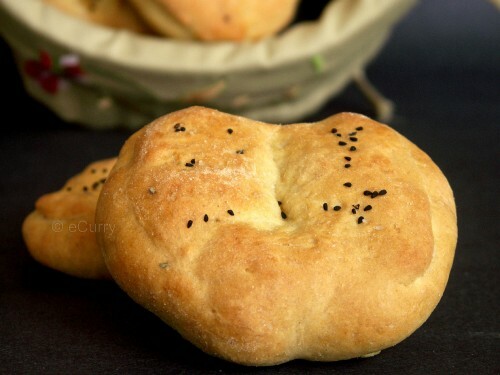 Known as ‘poee‘, it is a what what like a Pita bread, butterfly shaped and airy inside. It is very soft and spongy within. It is sold in markets and bakeries all over Goa. They are eaten with many savoury dishes like “Black Eyed peas in Spicy Goan Curry” (will post this later), but may be eaten with any Indian or non Indian dishes. The name seems to have some controversies.. being also called as “pao” or “poli” . But I suppose “poee”, “pao” & “poli” are all breads alright, but of different kinds and shapes. 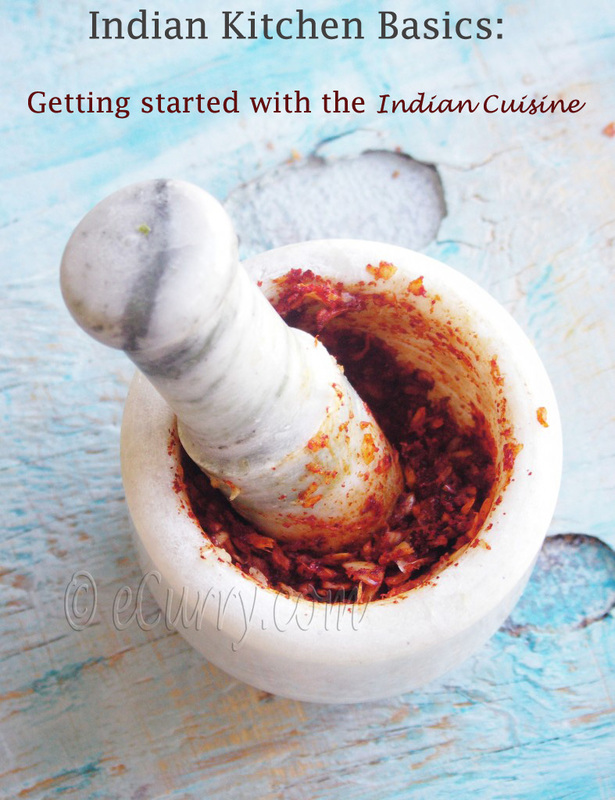 This recipe is adapted from Madhur Jaffrey’s “Flavours of India”. The moment I saw this recipe I knew I had to try it. Since most leavened breads use eggs or some kind of dairy too, this looked so easy, with the ingredients as simple as salt & flour with the addition of yeast. I have used part Whole Wheat Flour, as opposed to the use of refined flour in the recipe. I have also added some light spice for some light flavors. 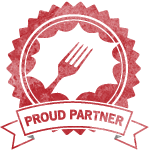 I am sending to Vegan Ventures, Round 2 hosted by Suganya from Tasty Palettes. 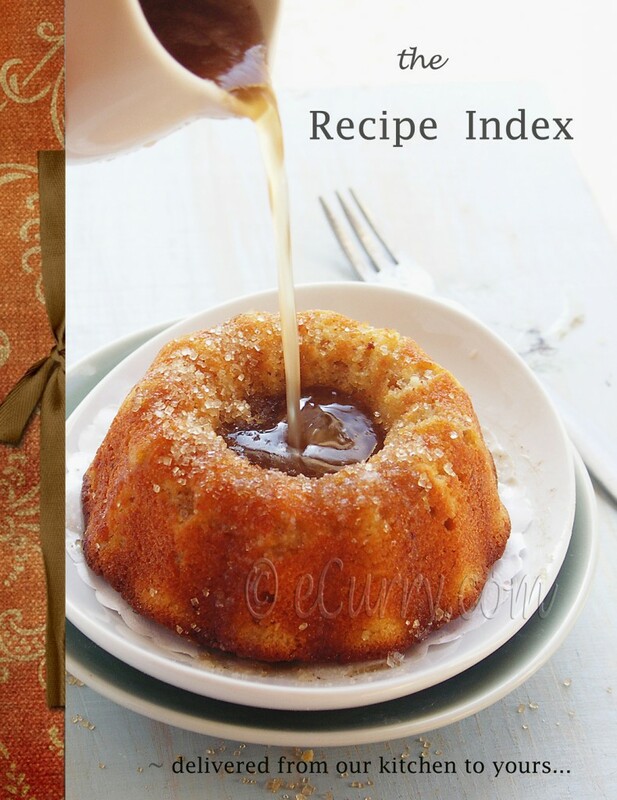 Dissolve the sugar in about 1/2 cup of luke warm water & sprinkle on the dried yeast. Stir well and set aside for 10 minutes to allow a frothy head to develop. Sift the flour & salt in a large bowl. Combine the carom seeds. Pour in the yeast mixture, along with 1.5 cups of water. Mix well at first using a spoon, then hands to incorporate all the flour to for a dough. If it looks too dry, add a little more water. 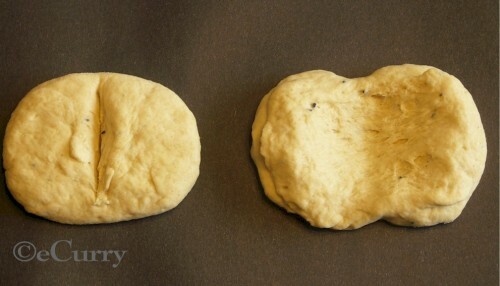 Turn dough on a well floured surface and knead well for about 5- 10 minutes until it becomes smooth and elastic. Dust regularly with flour to avoid it sticking. Place it back into the bowl, cover the bowl with a cloth or cling wrap & put in a warm place to rise for about 1 to 1.5 hours or until the dough has doubled in size. ( I put it inside the unheated oven). Pre heat oven to 425 degree F. Turn dough out onto floured surface and briefly knead again. Divide the roll into 6 equal sections. Slightly flatten each section, slash down the centre of each round with a sharp knife and spread out both to the right & left as if you were opening a book. They will roughly look like butterflies without antennaes. Place butterflies on a baking sheet, brush them with very little oil ( just enough to make the seeds stay), sprinkle the nigella seeds and lightly press. Allow to rise again for 30 minutes. Bake in over for 10 – 15 minutes until golden browned. Anyway who can resist a basketful of hot baked breads ? I have written above that Poee is to be eaten with some Spicy Curry, but the way they turned out, I could not stop myself from trying it out with just plain butter and it tasted heavenly!! It did turn out very fluffy and soft on the inside and crusty on the outside. This looks fresh out of the bakery ! Cant wait to try this out ! The breads look great Soma, and the smell of freshly baked breads is addictive na ? A simple butter or jam spread will be just fine with them. I was in a bread baking spree a few weeks back, and it ended in disaster when in all my enthusiasm, I tried to make bread using whole wheat pastry flour (very low in gluten), twice! and only then realized my folly. 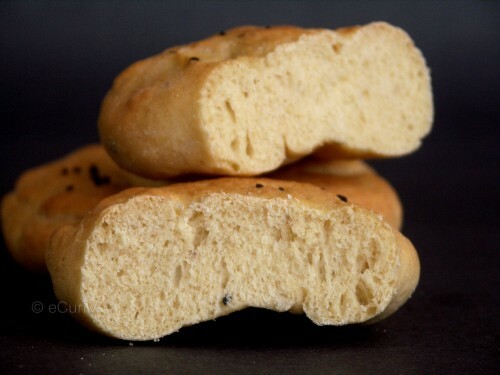 Delicious breads soma…bookmarked, will try them soon…am having much interest nowadays to bake bread myself..its simply prefect for novice bakers like me..
Havent heard of these…They look bautifully shaped and baked. They have come out so good and love the flavours. I used to get these fresh off a small bakery next door when I used to live in Goa..it was the most fun times…. Wonderful! I had to look up carom seeds — never heard of them but I’m sure I can find them in one of the many Indian markets we have here. I love bread and baking breads! Yours look so good. Sounds easy to make too. Thanks for the recipe! Mohana: Try it out. They smell great. Priya: I have never used pastry flour. This tasted good with butter.. I think I have to omit the ajwain for the jam to work. Priya: I am a novice baker too, & this was the easiet to do. Very uncomplicated. Rache: Are they called “POEE” in Goa? When I looked up there was some confusion to the name. Susan : They will be called “AJWAIN” seeds in Indian Groceries. Farida: I need to try out your Tanderi ( Tandoori Roti in India). 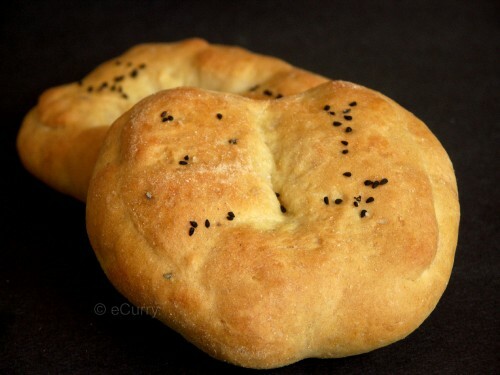 I loved the bread we used to have in one Turkish restaurant. They would have Nigella & Sesame. This looks quite like the real thing. This is sold fresh and warm every morning and evening by local “poder” on his bicycle. It is called Poee, but is plain, without any decoration/ garnish. Aparna: Thanks for the info. The actual recipe did not have any garnish. It was my idea:-) With some flavor I do not need anything to eat it with. The name is cute, but I am wondering how it is pronounced! Po – ee:) That reminds me of Swameeeeeeee!! On a ahem….serious note, hey – the ajwain must have given such a nice flavor!! Jude: The original bread as it is sold & also the recipe did not have any spices in it. 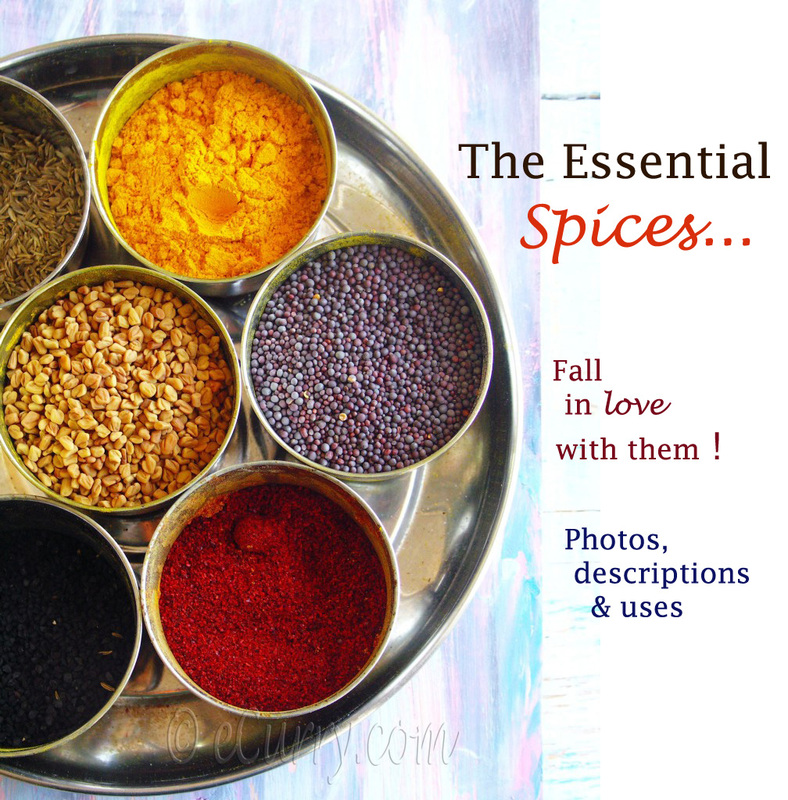 I like the the flavors of Carom/ajwain so I added it. I have been reading that they are stronger versions to Thyme… but I cannot verify. If u want, add any kind of flavor u prefer. first time here ,glad that I found your blog. Love all your baking recipes. Can this recipe be adapted to a bread machine?